Napoleon Bonaparte leading the attack at the Siege of Toulon, 17th December 1793. The Siege of Toulon (18 September - 18 December 1793) was an early Republican victory over a Royalist rebellion in the Southern French city of Toulon. It is also often known as the Fall of Toulon. The troops of the army said to be of the "Carmagnoles", under the command of General Jean François Carteaux, arrived at Toulon on 8 September, after those troops had recovered Avignon and Marseille, and then Ollioules. 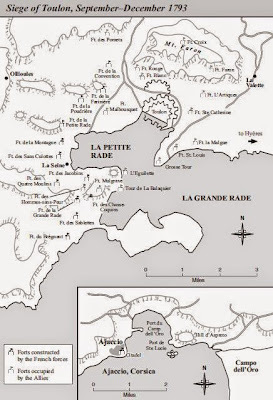 They joined up with the 6,000 men of the Alpine Maritime Army, commanded by General Jean François Cornu de La Poype, who had just taken La Valette-du-Var, and sought to take the forts of Mount Faron, which dominated the city to the East. They were reinforced by 3,000 sailors under the orders of Admiral de Saint Julien, who refused to serve the British with his chief, Trogoff A further 5,000 soldiers under General Lapoype were attached to the army to retake Toulon from the Army of Italy. The Chief of Artillery, commander Elzear Auguste Donmartin, having been wounded at Ollioules, had the young captain Napoleon Bonaparte imposed upon him by the special representatives of the Convention and Napoleon's friends —Augustin Robespierre and Antoine Christophe Saliceti. Bonaparte had been in the area escorting a convoy of powder wagons en route to Nice and had stopped in to pay his respects to his fellow Corsican, Saliceti. Bonaparte had been present in the army since Avignon, and was imposed in this way despite the mutual antipathy between these two men. Despite the mutual dislike between Bonaparte and his commanding officer, the young artillery officer was able to muster an artillery force that was worthy of a siege of Toulon and the fortresses that were quickly built by England in its immediate environs. He was able to requisition equipment and cannon from the surrounding area. Guns were taken from Marseilles, Avignon and the Army of Italy. The local populace, which was eager to prove its loyalty to the republic which it had recently rebelled against, was blackmailed into supplying the besieging force with animals and supplies. His activity resulted in the acquisition of 100 guns for the force. With the help of his friends, the deputies Saliceti and Augustin Robespierre, who held power of life and death, he was able to compel retired artillery officers from the area to re-enlist. The problem of manning the guns was not remedied by this solution alone, and under Bonaparte's intensive training he instructed much of the infantry in the practice of employing, deploying and firing the artillery that his efforts had recently acquired. However, in spite of this effort, Bonaparte was not as confident about this operation as was later his custom. The officers serving with him in the siege were incompetent, and he was becoming concerned about the needless delays due to these officers' mistakes. He was so concerned that he wrote a letter of appeal to the Committee of Public Safety requesting assistance. To deal with his superiors who were wanting in skill, he proposed the appointment of a general for command of the artillery, succeeding himself, so that "... (they could) command respect and deal with a crowd of fools on the staff with whom one has constantly to argue and lay down the law in order to overcome their prejudices and make them take steps which theory and practice alike have shown to be axiomatic to any trained officer of this corps". After some reconnaissance, Bonaparte conceived a plan which envisaged the capture of the forts of l'Eguillette and Balaguier, on the hill of Cairo, which would then prevent passage between the small and large harbours of the port, so cutting maritime resupply, necessary for those under siege. Carteaux, reluctant, sent only a weak detachment under Major General Delaborde, which failed in its attempted conquest on 22 September. The allies now alerted, built "Fort Mulgrave", so christened in honour of the British commander, Henry Phipps, 1st Earl of Mulgrave, on the summit of the hill. It was supported by three smaller ones, called Saint-Phillipe, Saint-Côme, and Saint-Charles. The apparently impregnable collection was nicknamed, by the French, "Little Gibraltar". On 11 November, Carteaux was dismissed and replaced by Doppet, formerly a doctor, whose indecision would cause an attempted surprise against Fort Mulgrave to fail on the 16th. Aware of his own incompetence, he resigned. He was succeeded by a career soldier, Dugommier, who immediately recognised the virtue of Bonaparte's plan, and prepared for the capture of Little Gibraltar. On the 20th, as soon as he arrived, the battery "Jacobins" was established, on the ridge of l'Evescat. Then, on the left, on 28 November, the battery of the "Men Without Fear", and then on 14 December, the "Chasse Coquins" were constructed between the two. Two other batteries were organized to repel the eventual intervention of the allied ships, they were called "The Great Harbour" and the "Four Windmills". 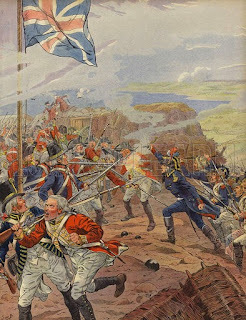 Pressured by the bombardment, the Anglo-Neapolitans executed a sortie, and took hold of the battery of the "Convention". A counter-attack, headed by Dugommier and Bonaparte, pushed them back and the British general, O'Hara, was captured. He initiated surrender negotiations with Robespierre the Younger and Antoine Louis Albitte and the Federalist and Royalist battalions were disarmed. Following O'Hara's capture, Dugommier, Lapoype, and Bonaparte (now a colonel) launched a general assault during the night of 16 December. Around midnight, the assault began on Little Gibraltar and the fighting continued all night. Bonaparte was injured in the thigh by a British sergeant with a bayonet. However, in the morning, the position having been taken, Marmont was able to place artillery there, against l'Eguillette and Balaguier, which the British had evacuated without confrontation on the same day. 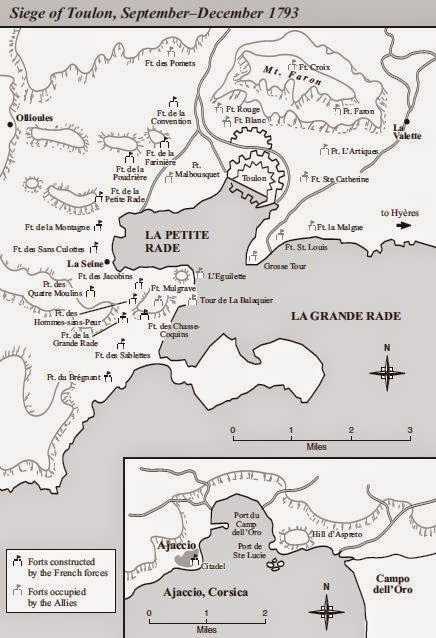 During this time, Lapoype finally was able to take the forts of Faron and Malbousquet. The allies then decided to evacuate by their maritime route. Commodore Sydney Smith was instructed by Hood to have the delivery fleet and the arsenal burnt; this has been described as the "most crippling blow to the French navy in the second half of the 18th century". The troops of the Convention entered the city on 19 December. The Suppression, directed by Paul Barras and Stanislas Fréron, was extremely bloody. It is estimated that between 800 and 2,000 prisoners were shot or slain by bayonet on Toulon's Champ de Mars. Bonaparte, treated for his injuries by Jean François Hernandez, was not present at the massacre. Promoted to Brigadier General on 22 December, he was already on his way to his new post in Nice as the artillery commander for the Italian Army. A gate, which comprises part of the old walls of the city of Toulon, evokes his departure; a commemorative plaque has been affixed there. This gate is called the Porte d'Italie.